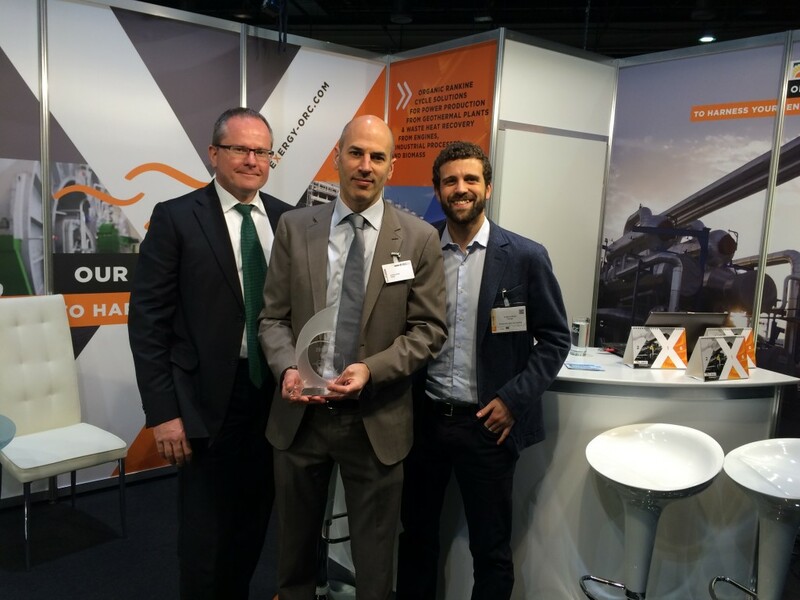 Exergy is proud to be the winner of the European Geothermal Innovation Award 2016. The prize was announced yesterday during the opening session of GeoTHERM exhibition and Congress in Offenbourg, Germany and was given to EXERGY for its world first innovation of 2-pressure-level cycle on a single-disk turbine demonstrated in Denizli Tosunlar geothermal plant in Turkey. Exergy won against strong completion from the four other endorsed nominees, Fangmann Energy Services GmbH & Co. KG, geoKOAX GmbH, Jaske & Wolf Verfahrenstechnik GmbH and Turboden S.r.l. Exergy had previously been a finalist for this award in 2014. The repeat nomination reflects Exergy's constant innovative approach, where the Company’s dynamic team is always seeking new solutions. The European Innovation Award is an initiative of the European Geothermal Energy Council and Messe Offenbourg. The award is given to companies that have made an outstanding contribution towards the field of geothermal energy in the form of innovative products, scientific research or project initiatives.